September 9 is the National Wiener Schnitzel Day. This food-related holiday is dedicated to a traditional Austrian dish which belongs to the best known specialties of Viennese cuisine. “Wiener Schnitzel” is translated into English as “Viennese schnitzel”. It is a very thin schnitzel made from veal which is breaded and then deep fried in clarified butter or lard. The term “Wiener Schnitzel” was first used in the early 1830s, though similar dishes had been known earlier. The schnitzel is prepared from about 4 mm thin veal slices. The veal is lightly hammered, slightly salted and rolled in flour, whipped eggs, and bread crumbs. Then it is fried in a large amount of lard or butter until golden yellow or brown. The large amount of fat is important for the schnitzel to cook evenly. Wiener Schnitzel is traditionally served with lettuce salad, cucumber salad, potato salad, or parsley potatoes. A slice of lemon is commonly served with the schnitzel to give the bread crumbs more taste. Rice, roasted potatoes, and French fries have become popular side dishes to Wiener Schnitzel lately. 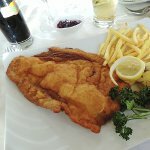 It is worth noting that a variation of Wiener Schnitzel made with pork instead of veal is usually called Viennese style schnitzel (Schnitzel Wiener Art).